Hi ladies! I hope you're all doing well =) I'm currently in a blogging rut and I just can't seem to get any blog posts up but I just had to share these quick swatches with you today! 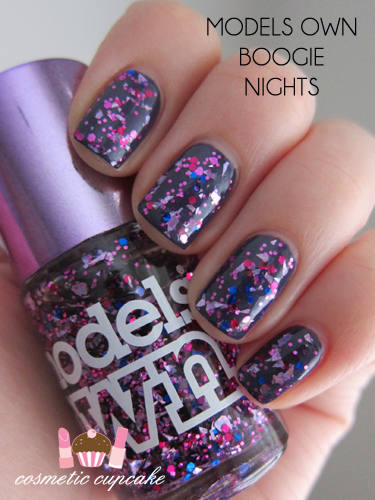 My lovely friend Aysh recently sent me over a care package that included the fabulous Boogie Nights glitter from the Models Mirrorball collection. You all know how much I love my glitter (if you don't then I don't want to talk to you! Just joking lol) so of course I couldn't wait to try it out. The collection is described as "nail frostings" but it just seems like a normal glitter..? It does have a little something extra though as they look AH-MAZING! Boogie Nights consists of different sized blue, fuchsia and purple round and hex glitters and larger irregular shaped shard glitters in a clear base. I LOVE the mix of different glitters! 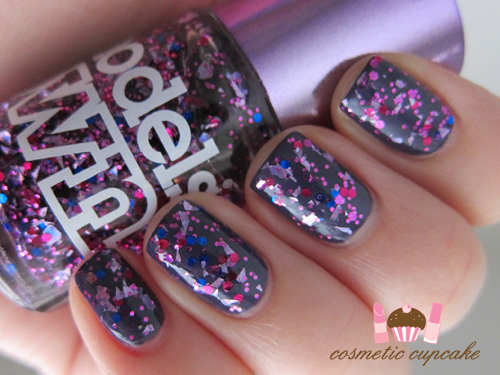 The formula is a little thick but the polish applies relatively evenly. I did have to go back in and "dab" to fill in the gaps. I layered 2 coats of Boogie Nights over 2 coats of Models Own Pure Purple and I got sooooooo many compliments! My pictures just don't do this combo justice. Dry time was a little slow but I use a quick dry topcoat so it wasn't really a problem. Aysh's lovely package! 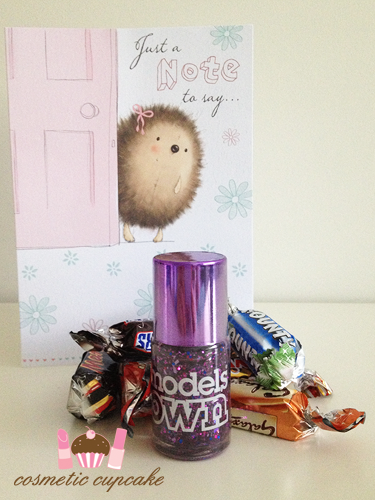 The card was so sweet and of course the choccies disappeared in no time lol. So pretty, I love this polish! Oh my, wish I'd bought this the other week. On to the wishlist it goes!! OMG, that card is freakin' adorable! I think it's just that time of year where we're all struggling - gorgeous mani!!! And the hedgehog - argh, so cute! That's some real party polish! Taylor Swift "Red" inspired FOTD and a giveaway!